I stumbled across these insults and attacks on the atheist Jessica Ahlquist, recently. In case you don’t know, Ahlquist is the atheist who filed a lawsuit against her school to remove a banner for “School Prayer” because it was unconstitutional. She won, and according to the vitriol spewed by some of these twits, America lost. I thought to myself: I’m supposed to be the Great Antagonizer, but I haven’t really been very antagonistic, as of yet. I also haven’t stumbled across mean ignoramuses since I started writing my blog, either. But now I have and so, I have prepared some responses to these intellectual midgets. I like this one. First off, if you want to write an insult, it’s probably a good idea to have a basic command of the English language. “you have not win s..t!”? Is that your best attempt at communication? There is something called a past participle in English: look into it. Also, well done: you made a tweet with 18 words, yet you conveyed almost nothing. It’s great that the Internet has allowed us to communicate such important information to one another. Hmmm… great idea: remove students and teachers that people (all people?) don’t like. By the way, how would this actually work? I don’t like you Jenn Gould. You probably wouldn’t like me. I don’t like anyone like you, and you probably don’t like anyone like me. I’ll give your little brain a moment to try to consider the ramifications of your original idea and why it doesn’t make sense. Ok, time’s up, your silence, I assume, means you’re confused (probably wouldn’t be the first time). The answer is that everybody would be removed. Also, you say, “get a life.” She’s doing something to change the world, and you are focused on her life, as evidenced by your tweet, and you’re telling her to get a life? I’m not a psychologist, but it seems like you might be projecting here. As for the statement about Jessica being “ugly,” I’ll have to say, I bet that there is a reason that you only show a picture of yourself from the nose up. The fact is that it is easier to notice obesity from the nose down. Also, it’s hard to notice how ugly someone is from just the nose up. Ironically, you still look very ugly. That’s an accomplishment in itself. So, I think I will take your last bit of advice. I don’t like you, physically or mentally, so I will stop looking at you. Yes. How about that. So, I guess the school will be empty then. You probably don’t believe in Thor or Vishnu or innumerable other Gods. You are an atheist to those religions. No school for you! 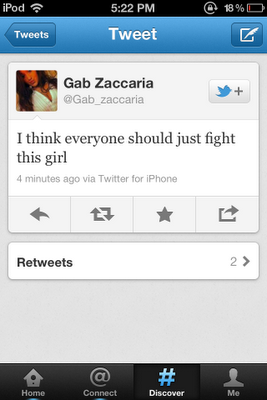 Although for some reason, it doesn’t seem like school was having any positive impact on you anyway. Wow, brilliant. This is your solution to things that you can’t comprehend. Well done. Again, another clever tweet. 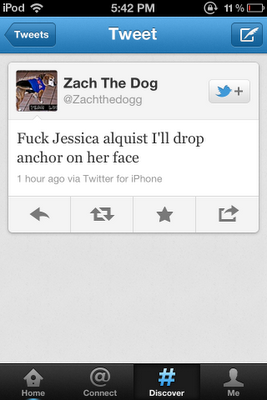 “I’ll drop anchor on her face” is close to a decent sentence. Words like “a” and “an” are not necessary for understanding a statement, but they convey intelligence. When a non-native speaker doesn’t use them or uses them improperly it is excusable. However, I have a feeling Zach is not a non-native speaker. When you don’t use these words, you do sound like an imbecile. Just giving you a heads up. You’re going to throw things at her? Well, bravo. By the way, what a stupid name. Stupid people cannot take over the world. Sorry. I’ve never met an atheist who told me that they think they will become a tree. That’s about the dumbest thing I’ve ever heard. Further, it’s not even your joke. I heard a comedian use this joke before. So, kudos on plagiarizing a lame joke. Then… you’re a coward. If you are really passionate about something, do something with your life. You might gain notoriety for punching an important person in the face. You might become the Jack Ruby of retards. But, alas, you’re too cowardly for that. That’s too bad. Not surprisingly, overall, the intelligence level of these goons was quite low. I don’t know what a person who isn’t smart is thinking when they start broadcasting their thoughts across the Internet. Do they think it will never come back to harm them? Are they not worried that someone in their family might see their hateful, ignorant and just plain stupid comments? What about their future employers? These people might get a laugh now, but I actually kind of pity their future prospects. 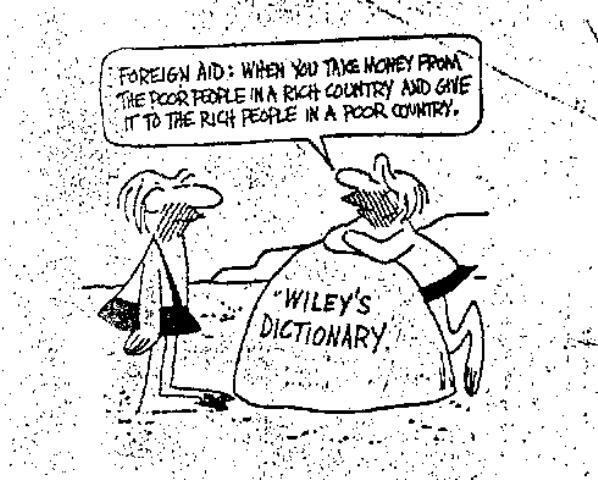 Many people worry about how much money their country “gives away” to other countries through foreign aid. Why do we throw away our money like this? In short, it is not throwing away money. After World War II Europe and Japan were decimated and America arose as the predominant superpower (Russia being somewhat further behind); mostly due to the war-time economic boom (building munitions and vehicles) and the fact that the only part of their landmass that was damaged was Pearl Harbor. So, an economic layman might think, why not just sit back as the superpower and enjoy the benefits? The problem is that international trade is a necessity in the modern world. The days of mercantilism were over and America needed countries to provide cheap products and raw materials to trade. The Marshall Plan was perhaps one of the greatest economic decisions by the White House. The amount of money “wasted” was in the tens of billions. Yet, this was not charity. The end result of the Marshall Plan was the creation of the greatest economies in Europe and Asia: Germany and Japan, respectively. People know that products from Japan are now top or near top quality; however, people forget that products from Japan were at one time very cheap and not the greatest quality. As a country develops, it can acquire more technology and invest more in research and development and thus improve the quality of its products. This has happened with both Germany and Japan since WWII. After the Korean War, the same situation happened. I remember reading a book about Korean history, and I can’t remember the exact numbers, but I remember the comparison of how much money was pumped into South Korea yearly, because it was shocking. The amount of money given to South Korea after the Korean war yearly was almost as much as was invested in the entire American South yearly. I was blown away by that figure, but I suppose that the American economists had the foresight to realize that this was a good investment. Accordingly, the South Korean “miracle” was created (heavy quotes because pumping that much money into such a small and, at that time, poor country and having incredible results is not exactly a miracle as much as an obvious result). Now, there are other ways that America spends its foreign aid too. Countries such as Pakistan and Egypt receive foreign aid, but this is not an investment in their development, per se. It is an investment in their stability and cooperation with the United States (although, granted, they are not always cooperative). This foreign aid, then, is a kind of diplomacy which is necessary for a country that is the global hegemon to invest in. Also, keep in mind that this amount of foreign aid pales in comparison to the aforementioned foreign aid contributions to Japan, Germany or Korea. Is there a reason that powerful governments don’t emphasize this point more clearly? Probably. What sounds better: your country is donating money to help another country or that your country is giving money to another country not because it cares about that country but in its own self interest to create and maintain trading partners? Of course the former sounds nicer, and it is the assumption by most people; however, it is just not true. So, is foreign aid a waste of money? Only if you think investing in the future is a waste of money.